Goliad State Park is 276 acres, near Goliad in Goliad County. In 1931, the state leg­is­la­ture accepted the main park complex from the city and county of Goliad. The leg­is­la­ture transferred it to the State Parks Board in 1949. Other sites became part of the complex in later years. Surrounding ranches and oil fields testify to the area’s role in Texas' history and developing economy. Spanish missionaries originally established the Nuestra Señora del Espíritu Santo de Zuñiga in 1722 near Matagorda Bay. 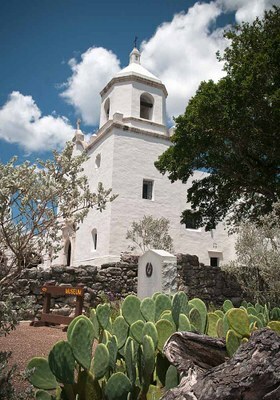 The church moved the mission to its present site in 1749. This mission was the first large cattle ranch in Texas, supplying its own needs and those of Spanish colonial settlements as far away as Louisiana. The mission closed in 1830. Neglect and plunder left the buildings in ruin. The Civilian Conservation Corps rebuilt the mission in the 1930s. The park is also home to Gen­er­al Ig­nacio Zara­goza's Birth­place, Plaza and Amphi­theater, 1/4 mile east of the park near Presidio La Bahia. 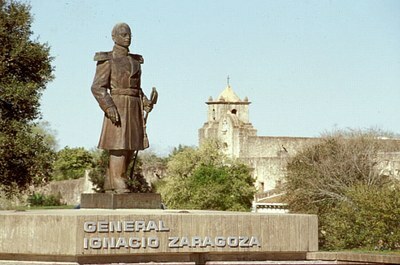 General Zaragoza assumed command of the rag-tag Mexican Army and melded it into a staunch fighting force. The army defeated the French on May 5, 1862, in the Battle of Puebla. The victory led to Mexico's inde­pen­dence from France and is celebrated at Cinco de Mayo each year. About 4 miles west of the main park on U.S. Highway 59 is another park unit: the ruins of Mission Nuestra Señora del Rosario. Missionaries established it in 1754. It was not as successful as its neighbor, and closed in 1792. Our newest park unit, El Camino Real de los Tejas Visitors Center, is about 1/2 mile north of the main park. The visitors center tells the story of the King’s Highway, which carried goods, travelers and settlers from Mexico City north to what would one day be the states of Texas and Louisiana. The University of Texas' Center for American History exhibition "'To Whom Was This Sacrifice Useful?' The Texas Revolution and the Narra­tive of José Enrique de la Peña."